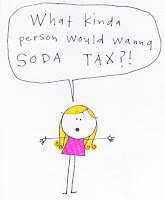 Increasing Taxes On Soda – Will It Help? In case you missed my post on Does Soda Cause Alzheimer's Disease or the recent guest post on Does Watching TV Make You Fat, new research has been released showing that indeed people will curb their drinking of soda if we simply tax it. "The American Journal of Public Health released a study this afternoon finding that when the price of soda goes up, consumption goes down." Additionally, "the 45-cent price increase on regular soda was associated with an increase in the sales of diet soft drinks. Coffee sales also increased." Notably, "consumers did not increase their purchases of juices and sugary snacks -- such as cakes and cookies -- when they slowed their purchases of sugar-sweetened soft drinks." "researchers at Harvard implemented a temporary soda tax in the cafeteria of the school's Brigham and Women's Hospital in Boston. Then they waited to see whether actual people changed their drinking habits." They found that "during a four-week period when the price of a 20-ounce bottle of soda went up by 45 cents -- which amounted to a 35% price increase -- sales fell by 26%. Meanwhile, sales of bottled diet soda rose by 20%." I’ve been saying this for a while now (see my post: American's Eat Way Too Much Sugar), soda is the bain of our existence and we all drink too much of it. It has been linked to diabetes, heart disease, obesity, and even to Alzheimer’s disease. Anything we can do to encourage people to stop drinking so much soda should be done. Ironically we are not only contemplating taxing soda but we should also be considering getting rid of the farm subsidy on corn as this is what makes the manufacturing of corn-syrup, the main sugar in soda and juices, so cheap. It is silly to subsidize the manufacturing of corn syrup and then tax the final product… ahh, but that’s the government for you. Ridiculous.